Recently, I’ve been contemplating whether to keep hamsters again? I’ve always loved hamsters because they provided me with hours of non-stop entertainment as I watching them sleep, running on the wheel or just stuffing themselves silly with the seeds and nuts. 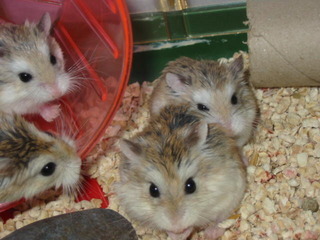 Here are some of the hamsters that I used to have. Firstly, the Campbells. This is how one of my Black Platinum Campbell played with the wheel. Next, we have the Roborovskiis. I like to call them Robolets for short. These are my Robolets. 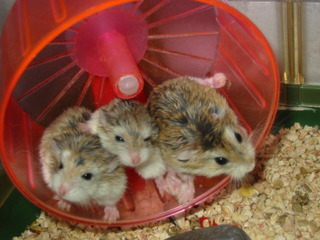 They ran so fast that their little feet are a blur whenever they are on the wheel. I was so shocked to find blood on the wheel one morning that I had to remove the wheel for a week to let them recover before putting it back. And now we come to the Syrians. I have to say that Syrians are my favourite among all the species of hamsters. The Syrian above was found anandoned at the void deck. Read his story here. Syrians are slow and clumsy – perfect for slow and clumsy people… like me! The next hamster that I’m gonna get is going to be a Syrian, and a long haired one! This entry was posted in Uncategorized and tagged dwarf, dwarves, hamster, lh, syrian. Oh dear! Oh dear! I think I may had an accident… Last night, I decided to let Creamie and Cloud out of their individual cages to play and socialise abit. That Cloud was on auto mode and vibrating so fast that all the motion I can see is in a blur… That boy is so hum sup! 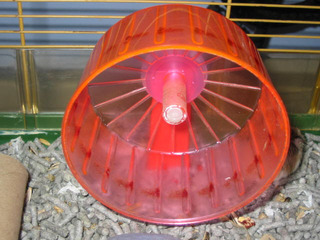 This entry was posted in Uncategorized and tagged hamster, mating, syrian. I was sleeping when I was woken by a ticklish feeling on my shoulder. 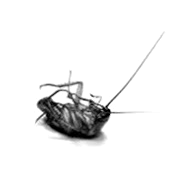 I fought hard to open my blurry eyes and I saw something shifting about then running away. I quickly switched on the lights and I saw Creamie, my Syrian hamster running along the edge of my bedroom wall! I caught her and put her back into her cage at the living room. How on earth did she escape again? I had already changed her cage from the tank to a Safari cage after she escaped the last time! She must have had a full excursion of the house and wanted to return back to her cage for a rest thats why she came to look for me. LOL! 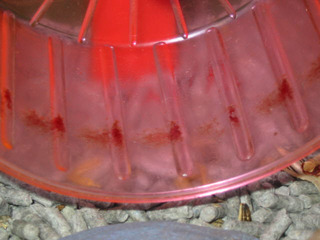 This entry was posted in Uncategorized and tagged escape, hamster, syrian. Creamie has been found! After more than 20 hours of freedom, I thought she would be gone forever… I really looked everywhere! Under the couch, behind the fridge and I even removed everything from the storeroom just to look for her. I even suspected that Creamie might have been eaten up by Dexter… Sorry, boy. It was 11.45 pm and I was lying down on my bed playing games on my phone when suddenly out of the corner of my eye, I saw something orange flashed by behind the rubbish bin but when I looked, there’s nothing there. Suspicious, I get out of bed and went forward to have a look. I peered behind the table, moved it a bit and something ran out! It was Creamie!! I tried to scoop her up but she ran back behind the table. I tried to catch her again and she ran out again… What a notti gal! Haha! 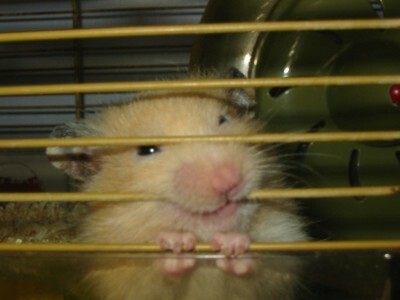 This entry was posted in Uncategorized and tagged creamie, found, hamster, syrian. Creamie is missing! She’s gnawed a hole out of the cover of her cage. Now, I can’t find her anywhere!!! This entry was posted in Uncategorized and tagged creamie, hamster, missing, syrian.